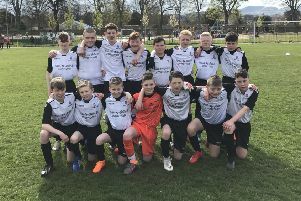 While many South East Region Youth FA fixtures fell victim to the frost last weekend, Edinburgh City Under-16s and Leith Athletic braved the cold at Portobello High School to battle for a spot in the fifth round of the Jackie Faichney Memorial Cup. Top division Leith dominated in the first half and much of the game was played in their opposition’s territory. Jay Watson opened the scoring for Leith in the eighth minute with a finish from close range. Soon after, Leith made it 2-0. Ethan Wynne found himself unmarked in the box at a corner and headed the ball just inside the back post. Rory Hunter added another in the 21st minute. The creative winger was alert to tap in on the rebound after Wynne’s initial effort could only be palmed away. Ten minutes later, Rhys McMurdo made a blistering run down the left wing and beat his man to whip a deliciously inviting ball into the box. Robbie King was there waiting for a chance as he collected the ball and finished well. Owen West was a rock in a Leith defence that looked comfortable on the ball throughout and stubbed out many City attacks before they gathered momentum. City goalkeeper Marc Anderson pull two saves from the top drawer in the opening 40 minutes. The first was a strong hand to deny King’s powerful shot and the second was an acrobatic effort to tip a clever dink from Cameron Stewart over the crossbar. Despite this, City found themselves further behind before half-time as Ewan Howie gambled in the box and tapped in another rebound, again from an initial Wynne shot. It didn’t take long for Leith to pick up where they left off. Just two minutes after the restart, they had the ball in the back of the net again. Hunter got on the end of a cross-field ball from King and tucked home for his team’s sixth of the day. In the 49th minute, City claimed a fine goal. They were awarded a free-kick on the edge of the box, slightly left of centre. Aiden Savage stepped up and confidently bent the ball over the wall and into the net. The City contingent soon had more to cheer. In the 70th minute, Dylan Boyle got their second when he capitalised on a rare defensive mistake from Leith and let rip a shot from just outside the box that curved away from the diving keeper. Two minutes after that, another rocket rippled the net. This time it came for Leith as Stewart was on target from the edge of the box, finding the top-right corner. Sulaiman Ashraf thought he had added his name to the list of impressive strikes this match when his effort from a free-kick found goal but it was ruled out as another player had touched it from an offside position before it crossed the line. Hunter completed his hat-trick shortly before the match ended. He curled a shot in from the right which rattled off the inside of the left post before crossing the line, taking the final score to 8-2 to Leith.